Living in Florida means being by the water — whether it’s the ocean or a backyard pool. It also means temperate weather year round. Who wouldn’t want to make Florida their home? If the Sunshine State calls your name, the Saviano 2950 plan by Lee Wetherington Homes in Bradenton, Fla., is a beautiful home to start with. The three-bedroom, three-bathroom home is where you’ll be able to entertain easily and, when not entertaining, you’ll be able to easily live the Florida lifestyle. The single-story home includes a huge great room that opens to both the kitchen and living areas, as well as to the home’s outdoor space. The home’s kitchen has a center island, giving you more workspace for parties or everyday meals. A bonus room means you can customize the home to your needs, using it as a media room or a home office. For indoor-outdoor living, collapsing sliding glass doors in the living area open to a covered patio with an optional outdoor kitchen. The Saviano 2950 plan includes a Florida basement, also known as a three-car garage. A basement just doesn’t make sense in Florida, but you’ll still have the storage space that a basement would offer. This model home also has some incredible, inspirational features, such as an outdoor shower and more than 700 square feet of outdoor space with pool and fire pit. What’s It Like Living in Country Club East? If you could imagine a place where there’s more than 150 miles of trails, more than 15 tennis courts and more than 50 holes of golf, then you’d be imagining Country Club East. The new-home community features many events and festivals, shopping and dining, a park and more than 80 clubs where you can enjoy hobbies with neighbors. Want to see more photos of this beautiful home? 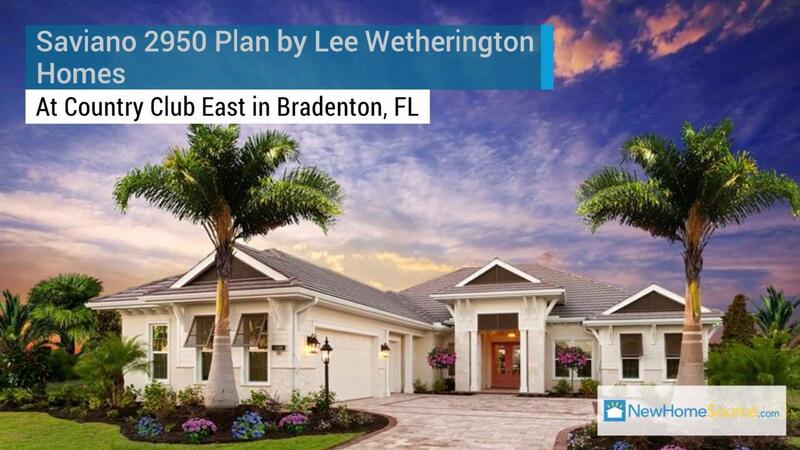 You can learn more about the Saviano 2950 plan, the Country Club East new-home community where it’s located, and see more homes by Lee Wetherington Homes on NewHomeSource. Search for affordable new homes for sale in Orlando. NewHomeSource has compiled a list of the top nine new homes in Orlando that cost less than $200,000. Find super affordable homes in the Tampa Area. NewHomeSource has found the top seven new construction homes for sale in the Tampa-St. Petersburg Area for less than $160,000.